“The Red Rose Rag” (1911), Percy Wenrich. “More Candy” (one step, 1917), Mel B. Kaufman. “Jungle Jubilee” (syncopated novelty, 1910), John W. Bratton. “Put On Your Your Old Gray Bonnet” (medley march, 1909), Percy Wenrich. “The Jelly Roll Blues” (foxtrot, 1915), Ferdinand Morton. “Paddy Whack” (characteristic two step,1906), J. Bodewalt Lampe. “The Witching Hour: A Spooky Rag” (1915), Charles N. Grant. “The Get-A-Way” (march, 1913), George L. Cobb. “My Uncle Sammy Gals” (one step, 1918), F. Henri Klickmann. “The Mississippi Rag” (cakewalk, 1897), William H. Krell. “Toreador Humoresque: A Ragtime Travesty on Carmen” (1918), M. L. Lake. “L’Encore” (duet for flute and clarinet, 1910), Victor Herbert. “Silver Heels” (Indian Intermezzo, 1905), Charles N. Daniels. “Sweetmeats Rag” (two step, 1907), Percy Wenrich. “Some Shape” (one step, 1917), George L. Cobb. “The Hesitating Blues” (Slow Drag,1915), W. C. Handy. “Swanee” (one step, 1919), George Gershwin. “Big Foot Lou” (cakewalk, 1899), Joseph Gearen. “Mona Lisa Valse” (1914), George L. Cobb. “By The Beautiful Sea” (one step, 1914), Harry Carroll. “Barnyard Blues” (Jazz Foxtrot,1917), D. J. La Rocca. “Red Onion Rag” (1912), Abe Olman. “Babes In The Wood” (foxtrot, 1916), Jerome Kern. “Delirium Tremems Rag: A Trombone Spasm” (1913), F. Henri Klickmann. “Jelly Roll Blues” (reputedly the first-ever jazz orchestration), among others. MORE CANDY was recorded in high-definition digital audio in historic 1857 Mechanics Hall in Worcester, Massachusetts; the recorded sound is truly spectacular. 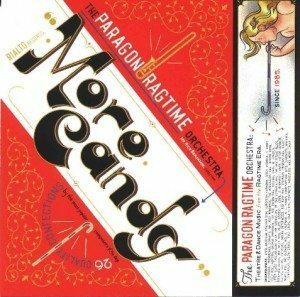 This is without doubt one of the Paragon Ragtime Orchestra’s best recordings and an attractive refuge for your rock- and rap-weary ears!